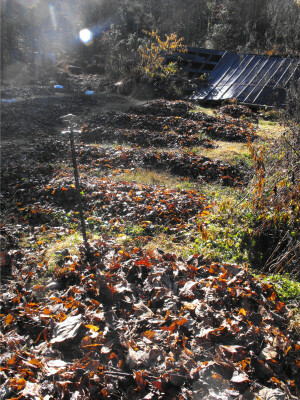 Am I harming the forest, I wonder, by raking out leaves for my garden? Leaf litter in the forest lowers light on the forest floor, changes the temperature of the soil, and affects soil and water nutrient dynamics. Depending on which plants you identify with, leaf litter can be a bane or a boon. The fallen leaves prevent many seeds from successfully sprouting and growing, but on the other hand the decreased competition is good for other types of seeds that are well adapted to pushing up through the leaf litter. Basically, raking leaves out of the forest turns the clock backwards a bit, making the ecosystem act a bit younger. Wild Turkeys are constantly scratching, and one set of scientists found that turkey scratched areas tend to help Red Maple seeds sprout but prevent oak seeds from sprouting. I wouldn't be at all surprised if there is some forest plant, animal, or fungus out there whose niche is forest soil scratched bare by turkeys. I figure that as long as I keep my leaf raking on a turkey-like schedule and don't take leaves from the same spot every year, I won't do much harm. I might cause some early successional plants to sprout, but they'll just be swamped by next year's leaf fall and likely won't get a toehold on the forest. Rinkes, Z.L., and B.C. McCarthy. 2007. Ground layer heterogeneity and hardwood regeneration in mixed oak forest. Applied Vegetation Science. 10: 279-284. Sydes, C., and J.P. Grime. 1981. 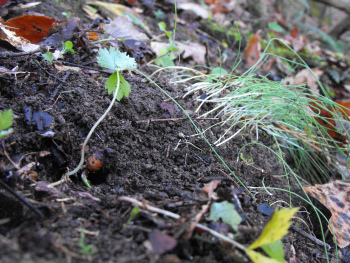 Effects of tree leaf litter on herbaceous vegetation in deciduous woodland: I. Field investigations. Journal of Ecology. 69(1): 237-248. And while you're at it, read our ebook about starting a small business or visit our homemade chicken waterer site. Cool! Mark has been peeing on the leaves to start them composting, but I'm still looking for some solid data on how much pee is optimal and how much is too much.